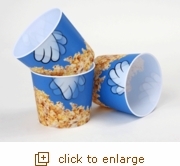 As you reach in for your popcorn, you'll laugh out loud at the cartoon hand bowl as it moves back and forth. Ideal for one or sharing between two, tub is plastic so it can be reused again and again for fun and laughs. Large tub measures 7" across the top and is 7.25" tall. Approximate 2-quart capacity, holds 14 cups popped popcorn.